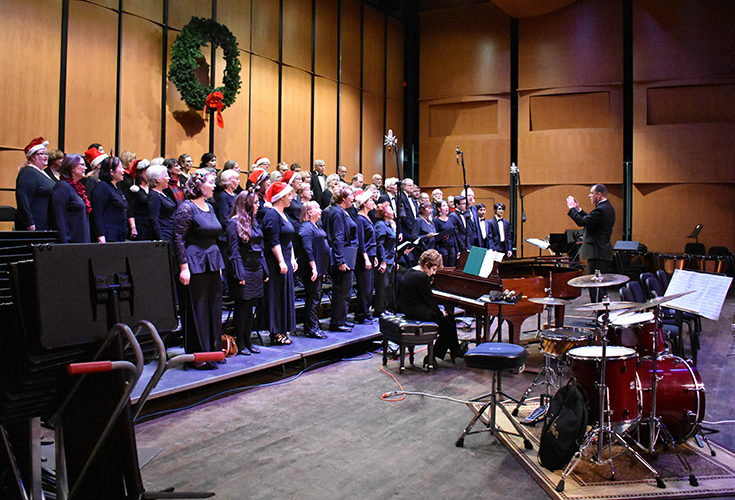 The evening NOVA Holiday Concert began with Chad Steffey directing the NOVA Community Choir in Magnificat in C Major, D. 486 by Franz Schubert. 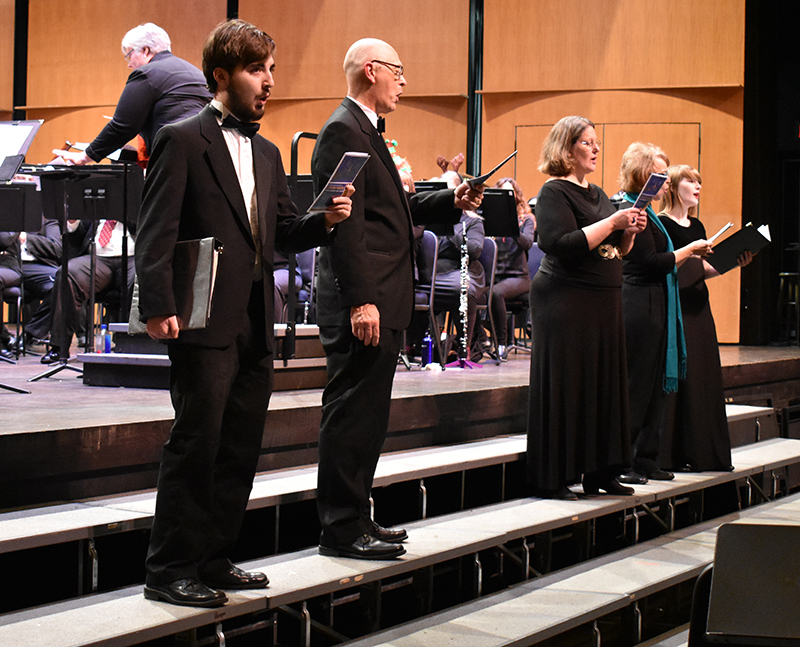 Soprano – Shelby Young, Altos – Halina Banas-Jones & Jackie Cohen, Tenor – Dave Shepherd and Bass singer Dylan Nohilly performed beautifully. 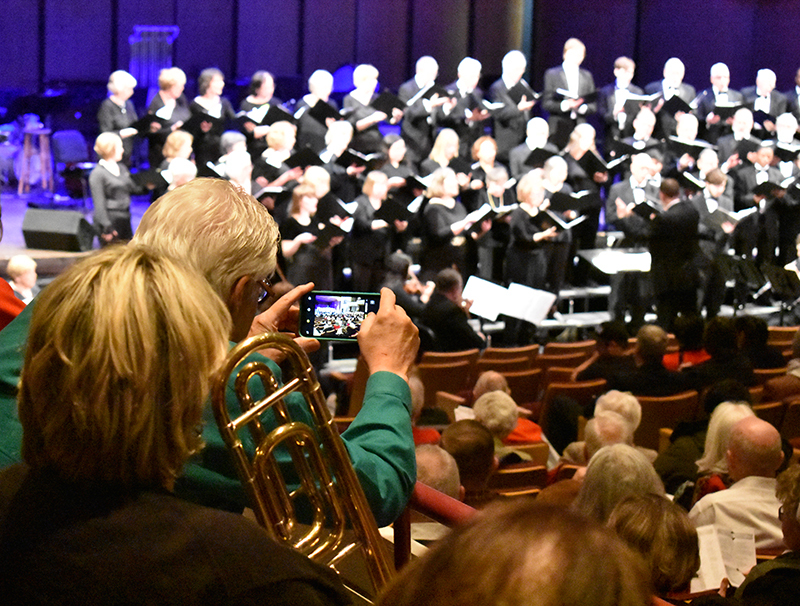 The NOVA Community Chorus. 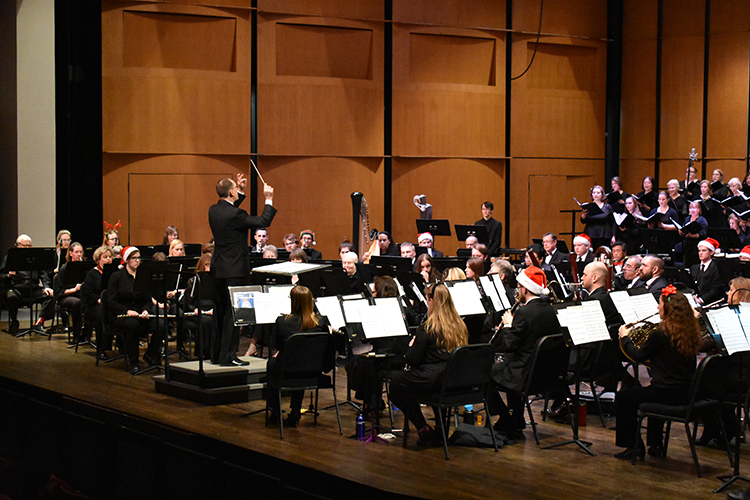 A Holiday Concert, Tuesday, December 11th, 2018. 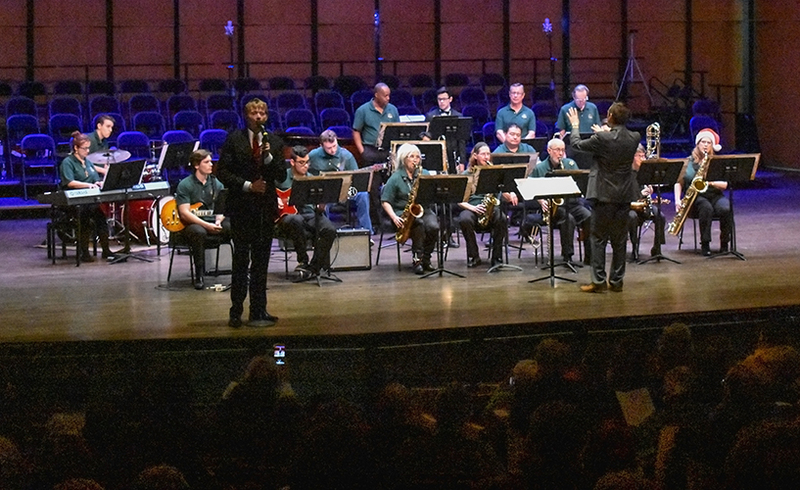 Featuring The NOVA Community Chorus, The NOVA Nighthawks Jazz Ensemble and the NOVA Alexandria Band. Photo by Britt Conley. 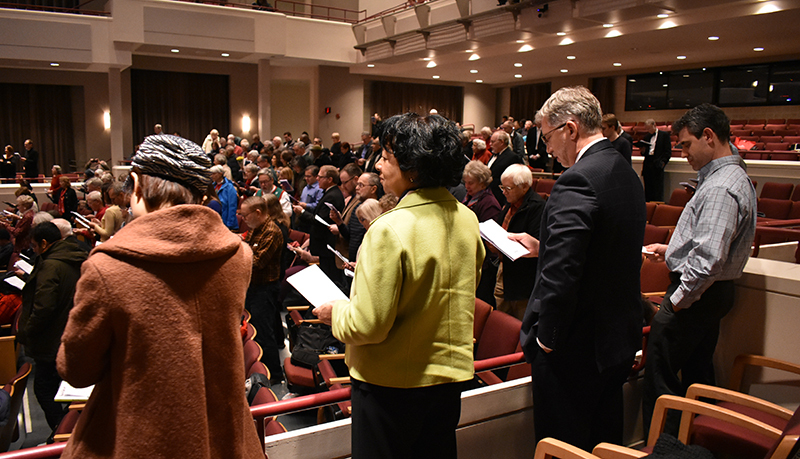 This was followed by, “In the Bleak of Winter” by Harold Darke, featuring Tenor Marcos Sonnenber-Nieves and Soprano, Barbara Shepherd. 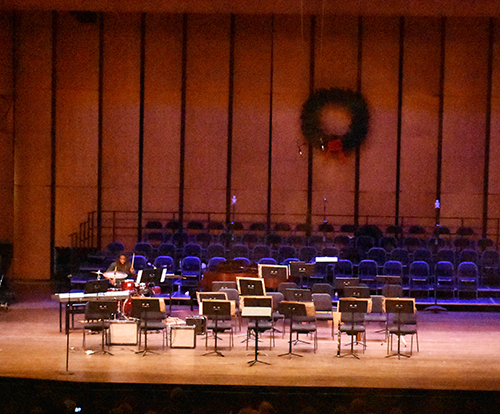 It was so wonderful to hear a variety of holiday works. “Ocho Kandelikas” Landino Song for Channukah, by Flory Jagoda was lovely and the final choral work was simple and beautiful, “A Merry Christmas” West Country traditional Song, arranged by Arthur Warrell. 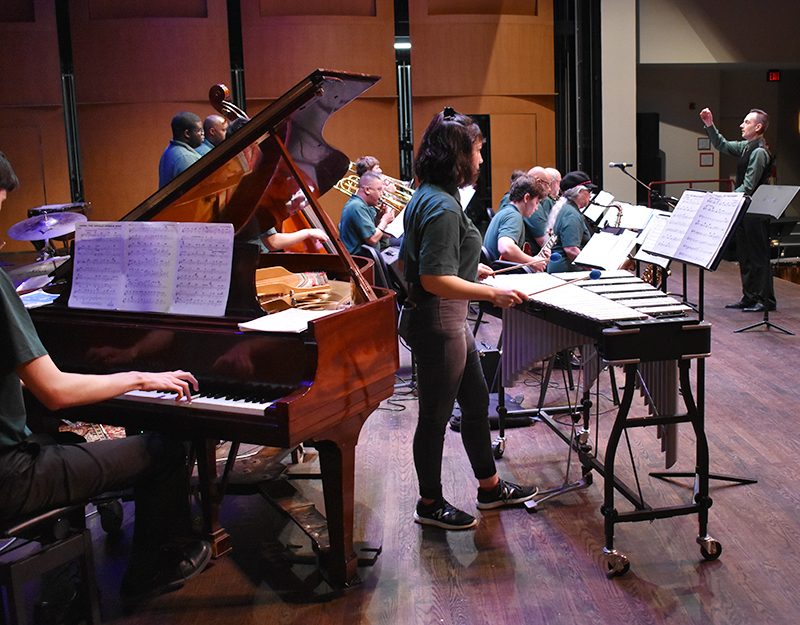 The Jazz Ensemble was on it! Their holiday program included, “Mary Did you Know?” by Mark Lowry and Buddy Green. The Nighthawks Jazz Ensemble. 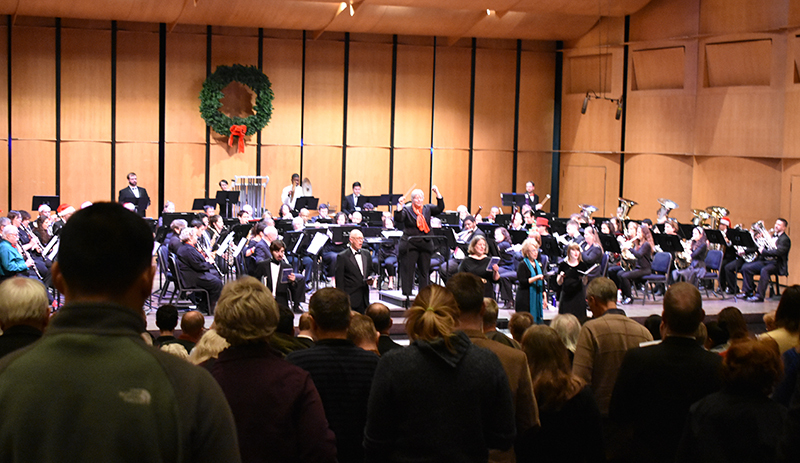 A Holiday Concert, Tuesday, December 11th, 2018. 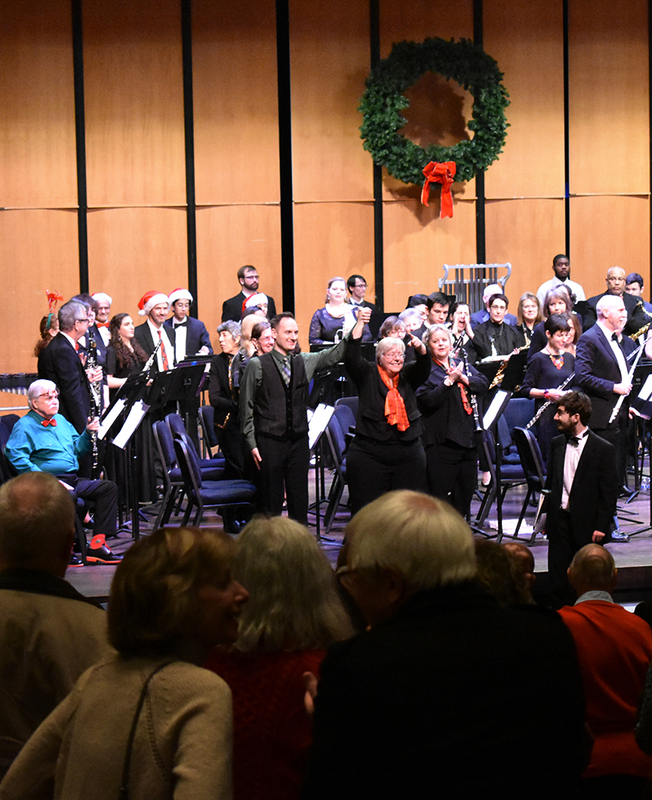 Featuring The NOVA Community Chorus, The NOVA Nighthawks Jazz Ensemble and the NOVA Alexandria Band. Photo by Britt Conley. 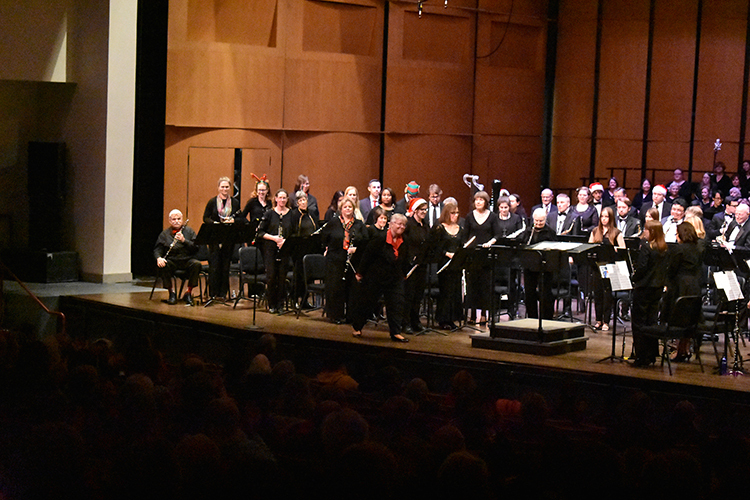 Jay Livingston and Ray Evans’ Silver Bells was a huge hit. 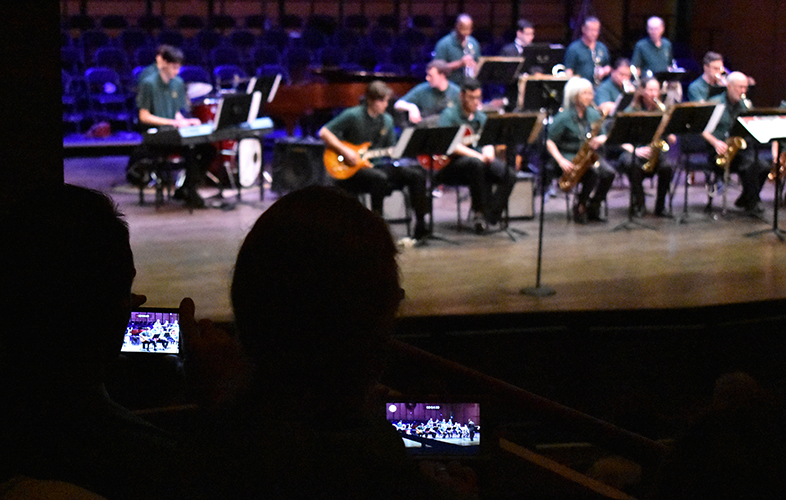 The NOVA Alexandria Band was at the ready, for the next section. We began with A Chanukah Celebration, arranged by David Bobrowitz. 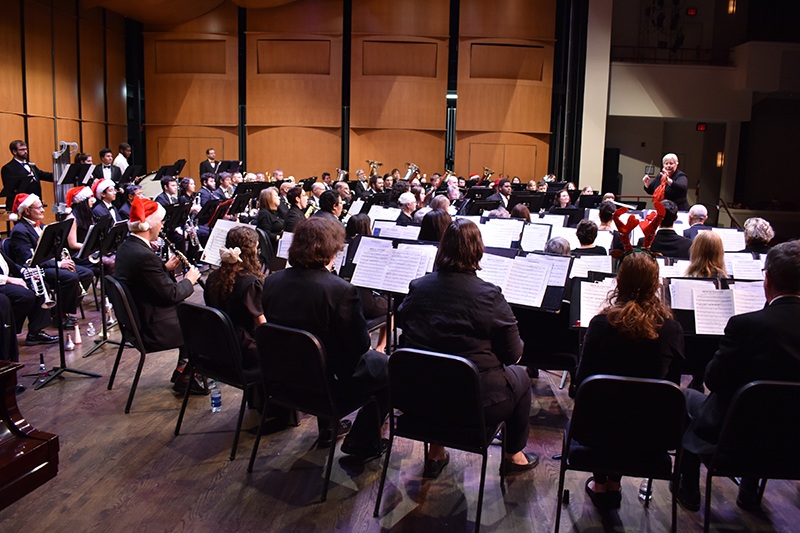 The NOVA Community Band. 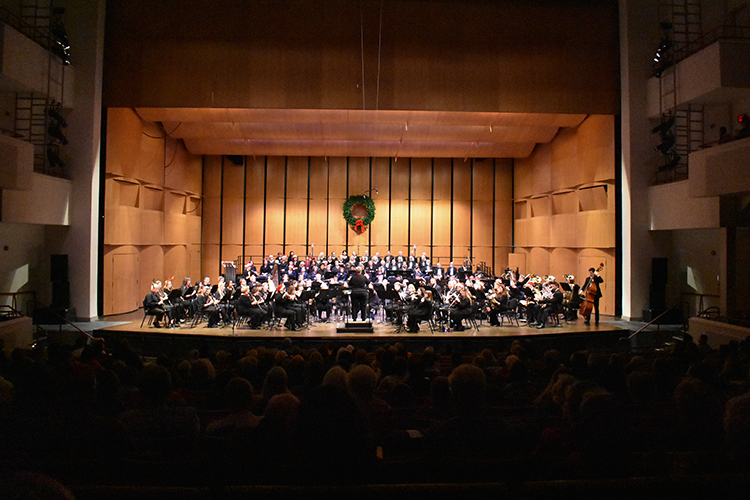 A Holiday Concert, Tuesday, December 11th, 2018. 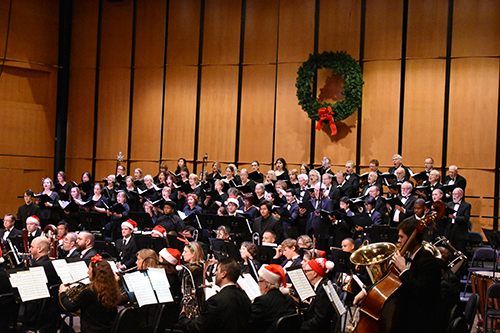 Featuring The NOVA Community Chorus, The NOVA Nighthawks Jazz Ensemble and the NOVA Alexandria Band. Photo by Britt Conley. I love it when the band don a great cap! Minor Alterations: Christmas Through the Looking Glass by David Lovrien, followed, just before Greensleeves. 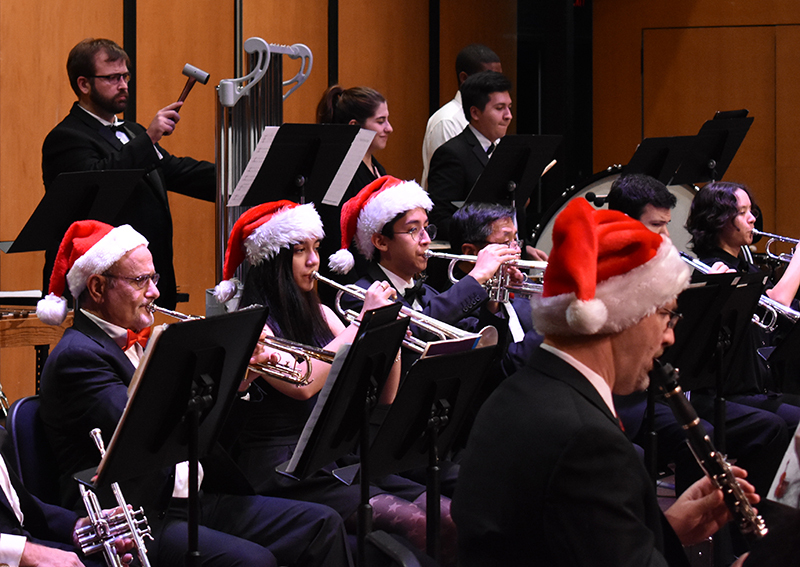 The students have been working hard all semester and this was a perfect night to shine! They all did an amazing job! The Christmas March was really fun! 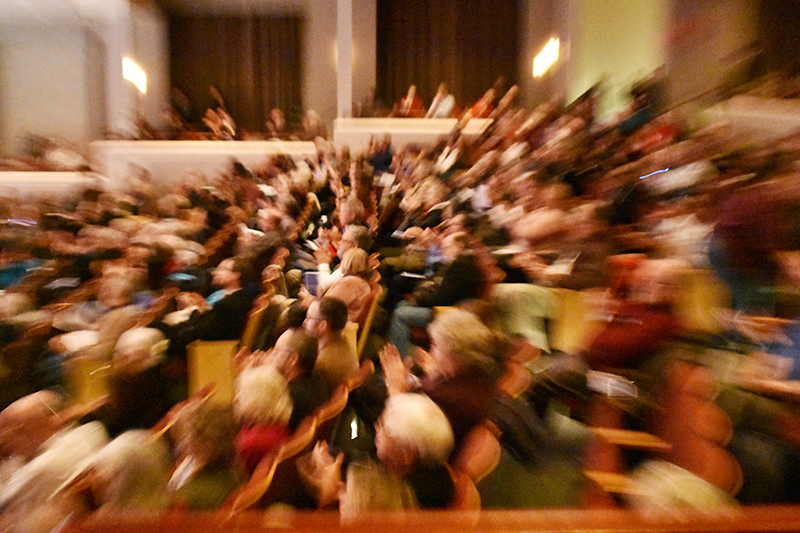 The audience really enjoyed it! We were luckily joined by our NOVA leadership! President Ralls, our Alexandria Provost, Annette Haggray and The Dean of the Arts, David Epstein were all in attendance. 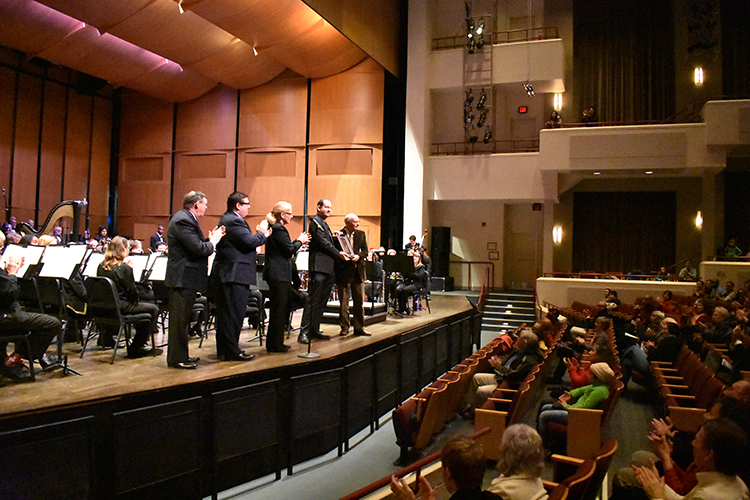 The concert was huge hit and the round of applause was rewarding for all. 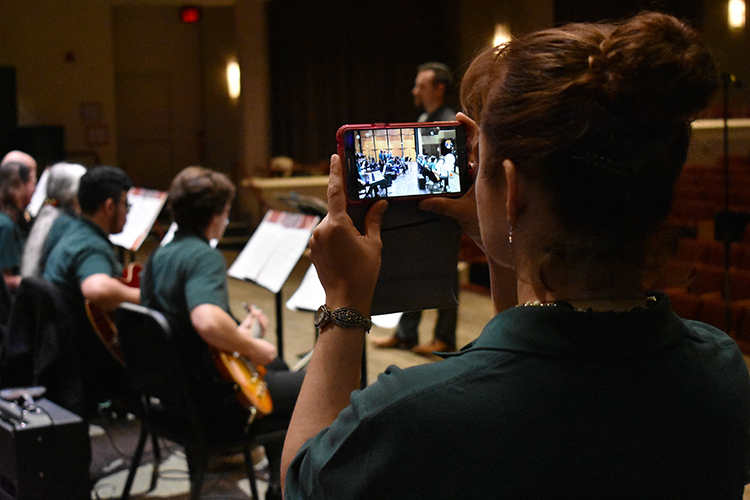 The students work so hard in all our Music Programs, between the Band, Choir and Jazz Band and this is their big opportunity to perform for family and friends. We really appreciate your support. 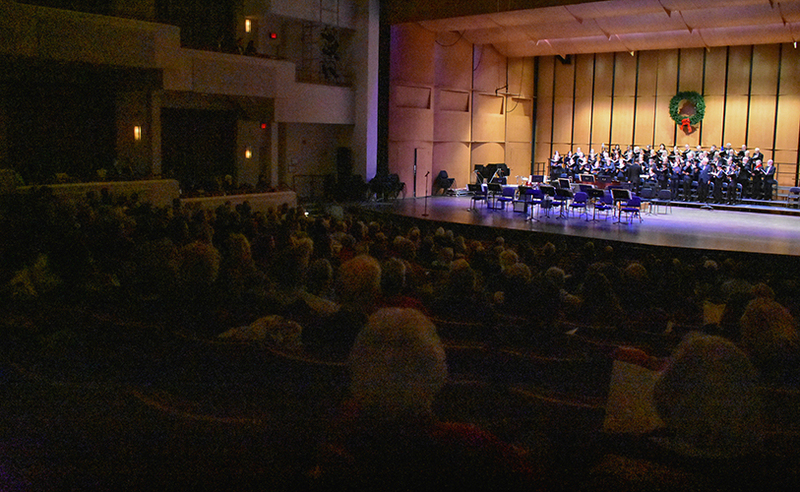 Please Join us for our next, wonderful evening Concert at The Rachel M. Schlesinger Concert Hall and Arts Center! 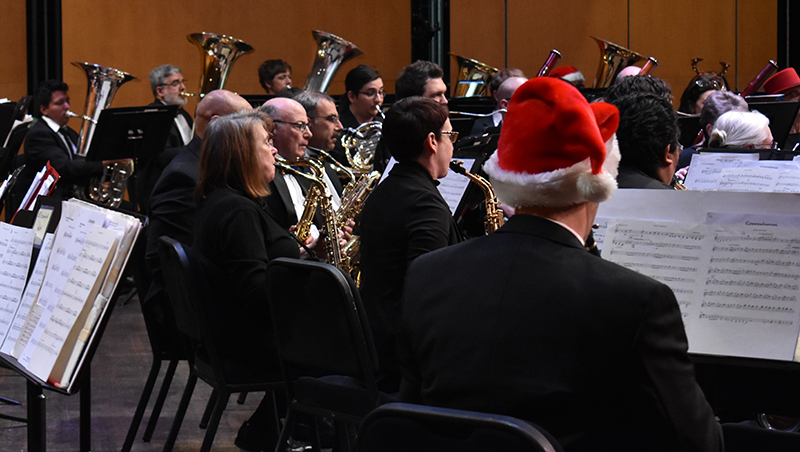 The Band will be putting on the Annual Children’s Concert! Thursday, March 7th, 2019 at 7:30 pm. 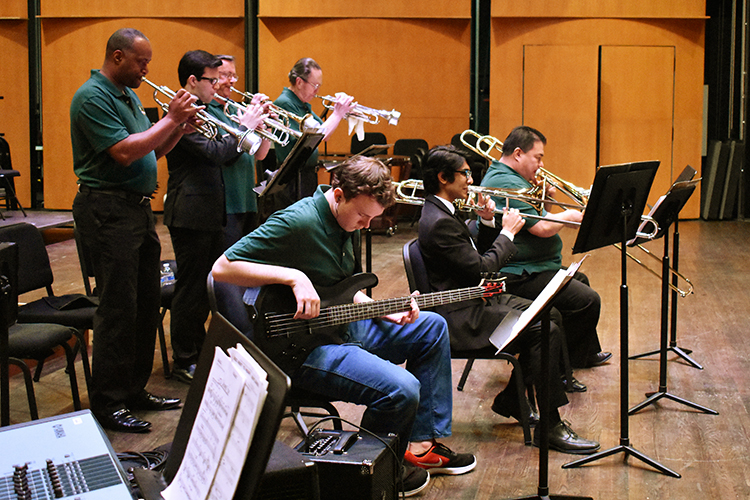 The Concert will feature special guest soloists: Trumpeter Dennis Edelbrock, Trombonist Harry Watters, and clarinetists Brian Jones and Charles West! We will also provide the world premier of a piece by composer Robert Thurston! 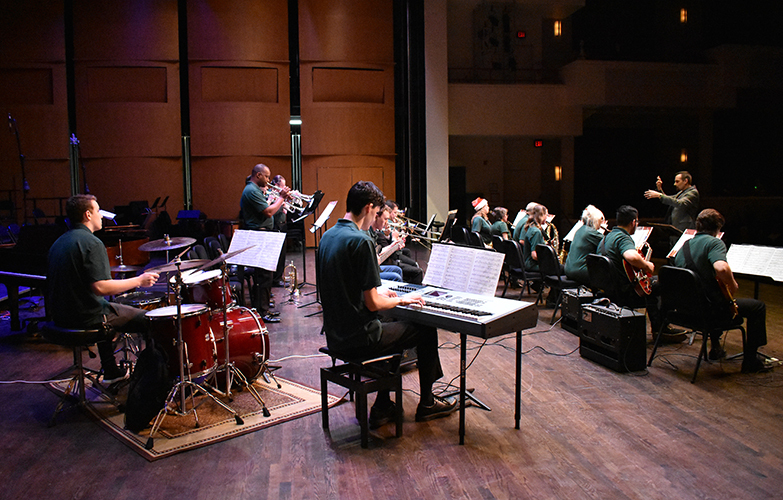 Joining us will be The George Mason Elementary School Jazz Band, The George Washington Middle School Jazz Ensemble, The Alexandria City Public Schools Student Finalists in the National PTA Reflections Program and the band will be joined by area School Band and Orchestra Students!!! It’s going to be quite the night!!!! What a great night!!! 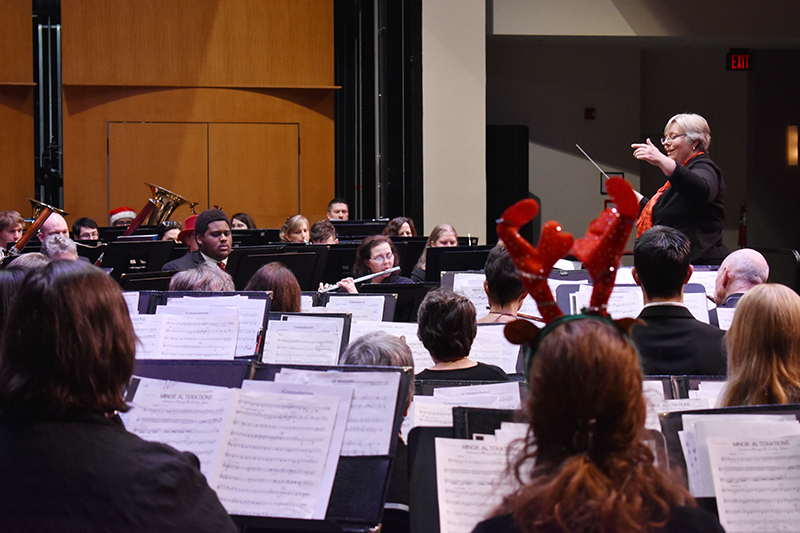 The NOVA Alexandria Music Department presented it’s annual Holiday Concert on December 7th, 2017. 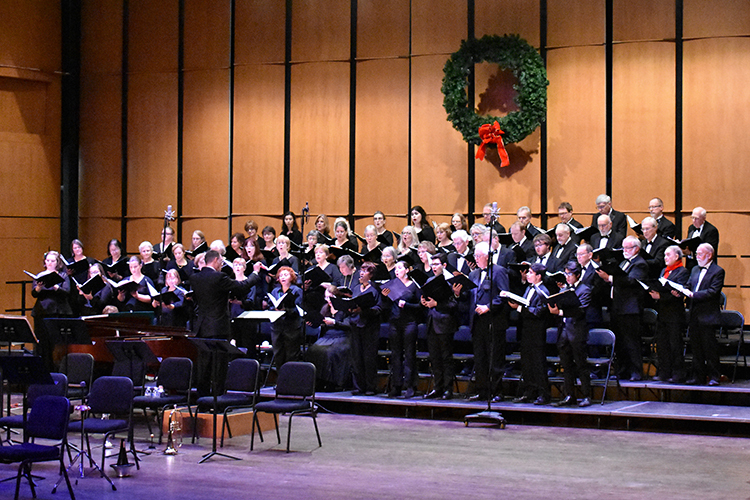 The evening began with the NOVA Community Chorus performing, For Unto Us a Child is Born from “Messiah” G.F. Handel. Based on Isaiah 9:6. 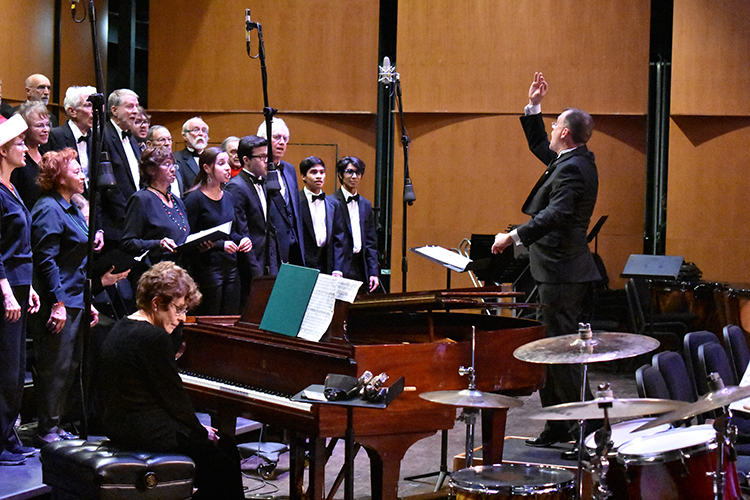 Sure on This Shining Night from “Nocturnes” by Morten Lauridsen was also a hit. The work was based on a poem by James Agee. The Choir ended it’s first half of the concert with a very merry rendition of Jingle Bells by James Pierpont, arranged by Gordon Langford. 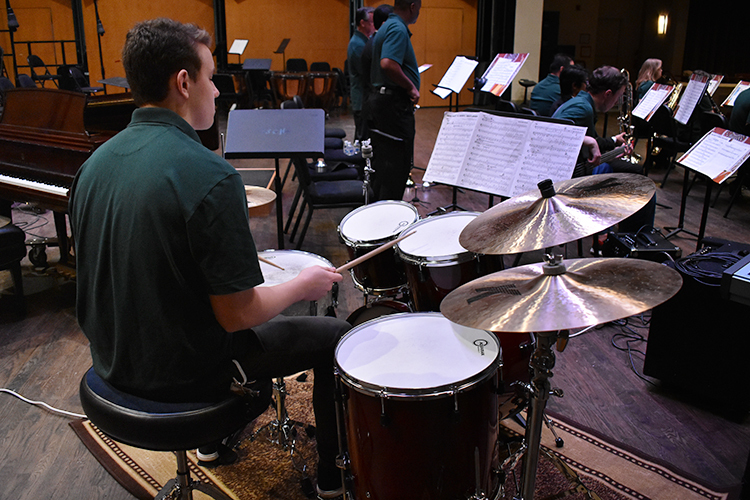 Next up were our NOVA Nighthawks Jazz Ensemble beginning their set with God Rest Ye Merry, Gentlemen arranged by Gordon Goodwin. 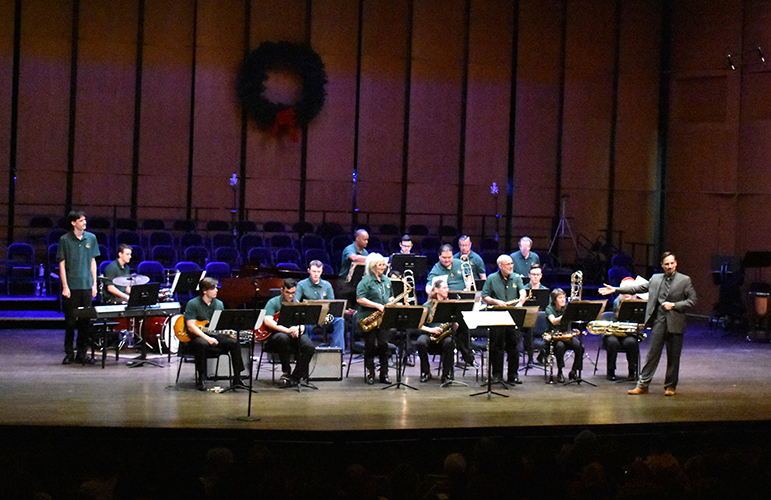 The group also performed Blue Christmas by Billy Hayes and Jay Johnson. 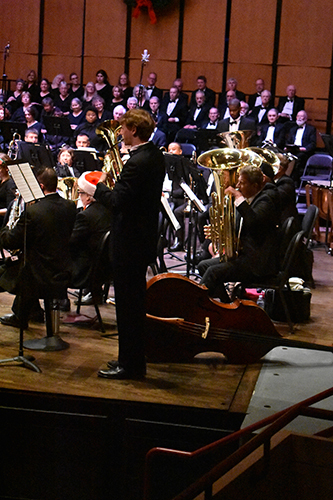 The work was arranged by Austin Windorski and The Little Drummer Boy by Katherine Kennicott Davis, arranged by Bob Washut. 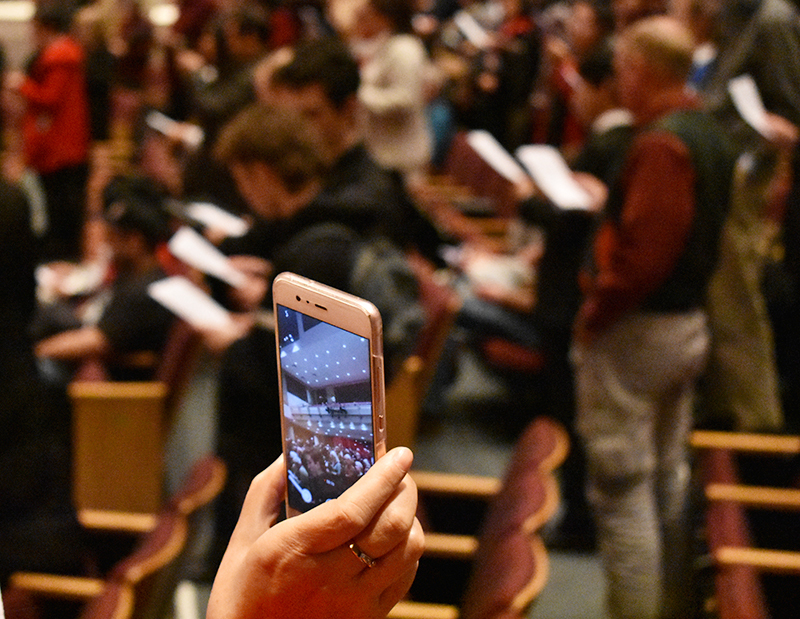 The minute they began, the phones begin popping up to catch the moment. 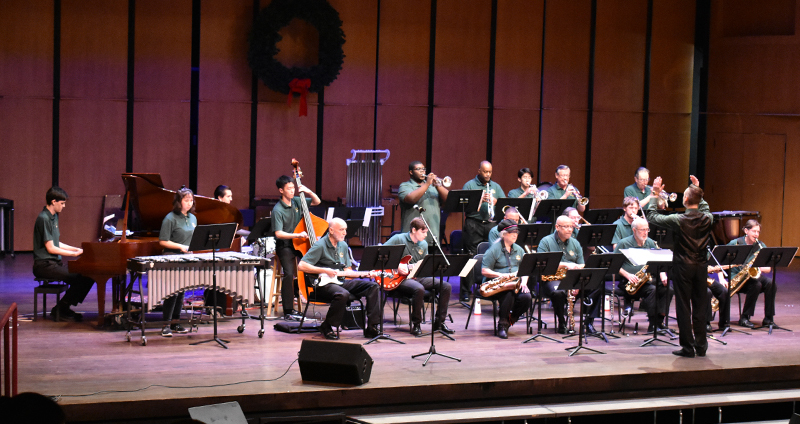 Holiday Jazz is really wonderful! 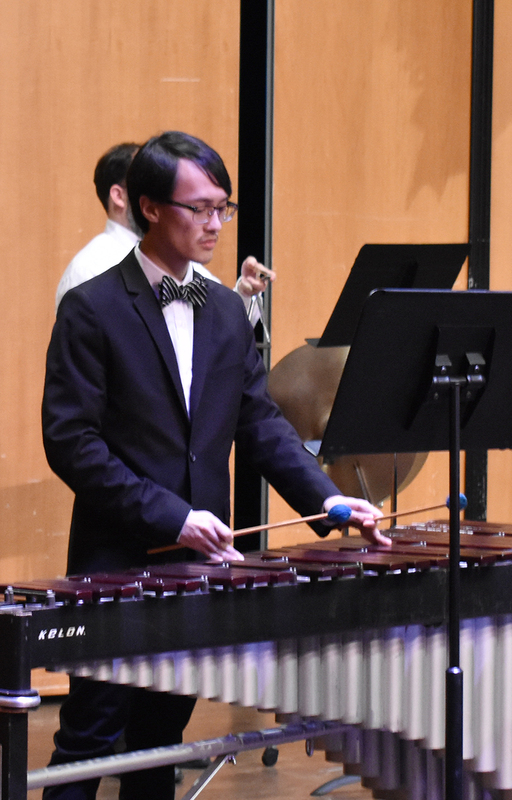 The audience returned to a wonderful surprise to many, but not our students. Our music students are not only enjoying our new Center for Design, Media and the Arts, they are also enjoying all the brand new Steinway’s that fill each room! Tonight our Dean, Jim McClellan and Jonathan Kolm, our Assistant Dean and Director of the Music Program here at NOVA, were presented our new, official Steinway School plaque! We are all so excited for what this means for our college. 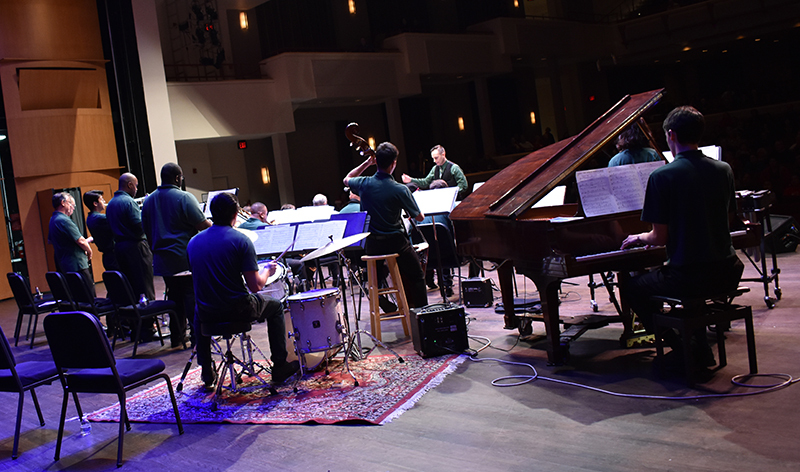 After our exciting Steinway presentation, the NOVA Alexandria Band hit the stage with, “And the Mountains Echoed: Gloria! 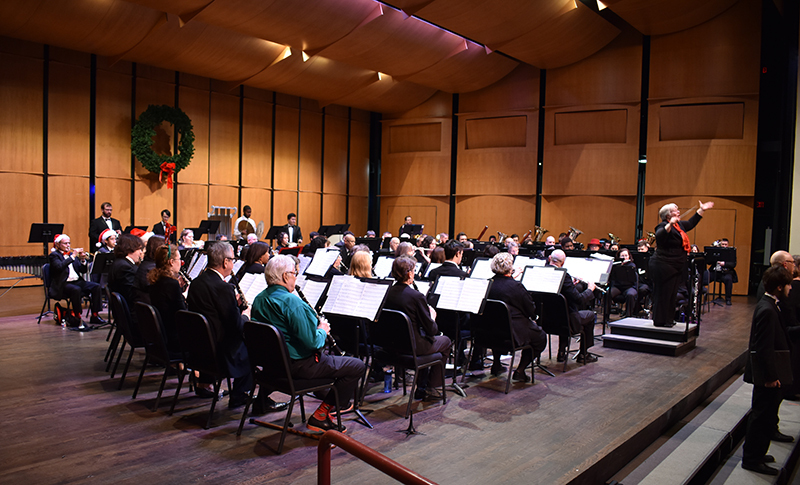 by Robert Longfield, followed by Gesu Bambino (Pastorale for Christmas by Pietro Yon, arranged by Mark Rogers and the Dreidel Dance by Robert Thurston. There was even a secondary Brass rendition of Jingle Bells! A phenomenal night for the Band! A grand time was had by all! 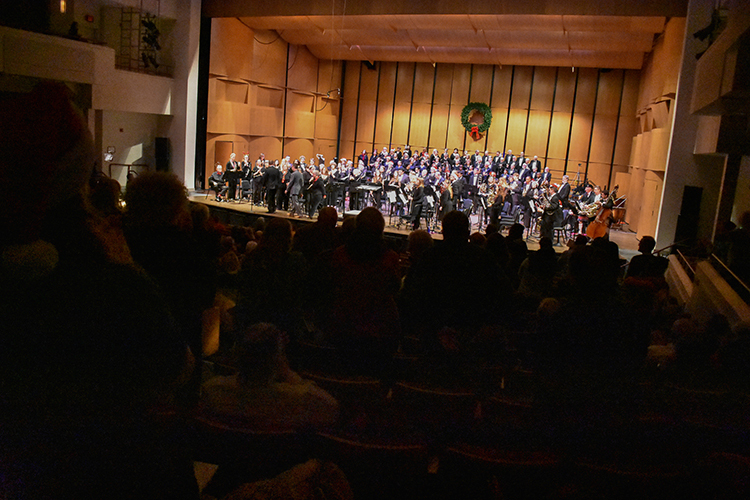 The audience was kind enough to give everyone a standing ovation! 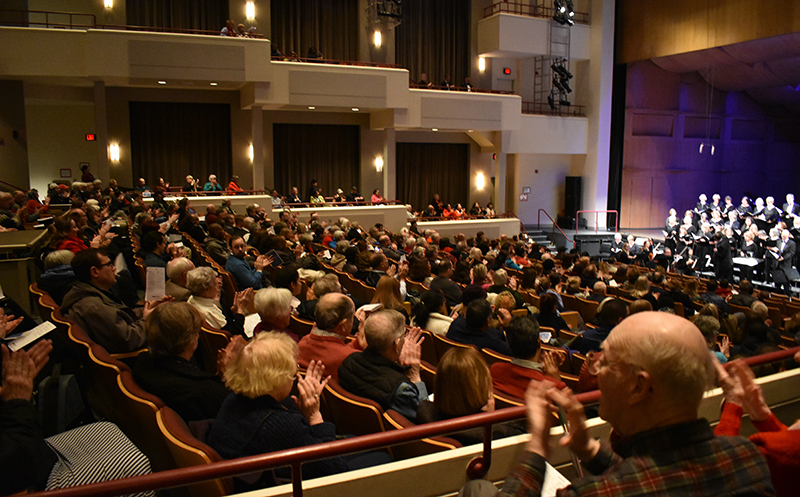 Thanks to everyone who performed, helped organize and those who came to hear what we have to offer! We hope you have a wonderful holiday! The NOVA Alexandria Band’s Children’s Concert on March 1st at 7:30pm. The NOVA Community Chorus, The NOVA Alexandria Band and The NOVA Nighthawks Jazz Ensemble, Friday April 27th from 7:30-9:30pm.